I thought I might share my newest discoveries with you today... something I am working on. Income from home can seem so overwhelming to create, so any idea that involves less work and money and time is great to me. I have known about drop-shipping for a long time, but wasn't able to focus on it and didn't know WHAT I would even try to sell that way. Drop-Shipping is happening a lot these days. I suspect all those "shipped by" notes at Walmart's site are examples of drop-shipping connections. I have also seen some videos and checked out the income/sales option in other places. Awhile back in this year I watched a bunch of videos from and about Drop Ship Lifestyle (.com) and decided to start looking for something I could try to sell as a drop-ship item. I think I have found my answer in print-on-demand (POD) designs at Printful (.com) !!! I just want to start learning about drop-shipping with ONE product. I became interested in Printful because of something I saw about t-shirt designing... probably on YouTube, but I can't remember. I am always browsing the web and don't keep track of all those details. It seems that Printful integrates with Etsy shops, which is ideal for me. I did see one video that said it can be a problem setting it up, but I haven't reached that point in the process yet. I am trying to get my first design effort ready to upload, which is a PDF format so far. I have also seen someone at Etsy selling posters via Printful, and lots of cup design options (in photo templates, anyway). These three selling options are ideal for my plans. I don't have any real design software, but I always wanted to be able to create with Adobe products. In my explorations, I discovered https://www.fmexpressions.com and their FREE online course for Adobe Illustrator to design for t-shirts. I am in the process of going through the course now. It takes about 2.5 hours if you do it all at once, according to the site. It is five segments so you can do one segment at a time if you want to. I have finished the first segment and it was fine... easy to understand. I will probably do the whole course again, or parts of it, but it is a great resource. It is also good for me to go through this free course because I am interested in Teachable (.com) as a resource for making online teaching courses for any topic. That is a future goal, in progress. Experiencing online courses help you to decide what you want in your own. As I search for ways I can increase my income, a smartphone continually surfaces as a MUST-HAVE item, which I don't yet have. I think I need to move it up to a higher place on my list... maybe first place. To make a tablet into a phone, you have to have the phone account first, then add the tablet as a second line... etc. It is all connected... income, supplies, equipment, technology, success... trying to figure out what to do first is such a hard challenge at the poverty level. This is why I am hoping my Printful with Etsy effort will help solve some of those problems. I know I will be working on a marketing strategy, too... getting all these tasks organized. :-) I am seeing that the monthly costs are going to be huge once you connect to all these separate websites. I may need to figure out the best financial commitments and what can be done by me. All these site charges also help me think about my own selling choices... for my crafts and for my WT products. I am not sure what this trend means for the future. Poor people cannot afford all these necessary internet tools. Checking IN - Getting Ready for CHRISTMAS !!! I am getting my plans in order, and my supplies! I hope to crank out some items to sell in the next few months. Photos are a problem for me, so I am working on that issue. All we can do is just keep going...the best we know how to. I will catch you again soon. I tend to post at the FB page, but I am working toward a weekly blog post here. That should be achievable, especially after I get my production issues worked out. Welcome to my first multiple photo effort... 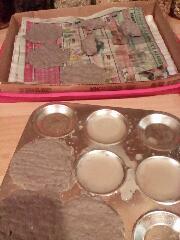 I uploaded six (6) photos from my first effort to make paper pulp out of newspapers. The only way I can see them is at the end of the post... so this is a brief description of what I wanted to share. 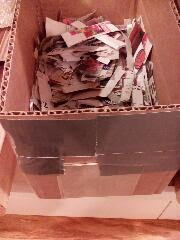 Photo - 1 - is the box of shredded newspapers I created for my paper mache projects so I grabbed it for this first effort. I guess I need to say that is what is left in my box of shreds. I barely used any of it for this soaking... and I was amazed at how much pulp it made! 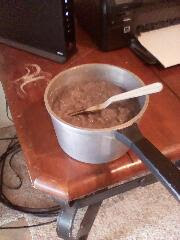 In photo - 2 - You can see the blended mush, called pulp, in the pan I have dedicated for craft use. You can also see how the black from the paper gets on everything... at least everything plastic! In the pan is the plastic art knife I grabbed to use as a mixing spoon. 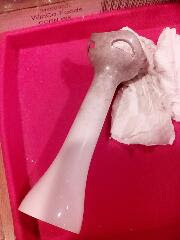 In photo - 3 - you can see what it did to the end of my blender. I'm not sure yet if I have to dedicate this blender to paper pulping or if I can still use it for other crafts, like mixing plaster. I was so surprised to see how much it made that I didn't know what to create with it. I finally decided to make and dry molded squares in my silicone mold for crafts only, planning to store it dry and use smaller amounts when I get to the making paper sheets part of this craft. 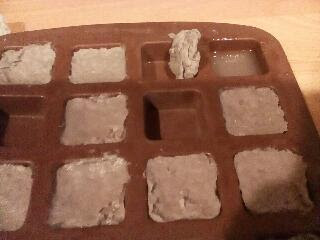 You can see the molds in photo - 4 - and a couple of squares that came out of their places the way I hoped they would. There was so much water still in the pulp after I strained as much as I could out of it, in sections. Then I turned it over on more newspapers to drain water from the molded shapes. I had some left over so I did the same thing with sections on a small metal pan I had, turning it over to drain more also. You can see in photo - 5 - that I decided to squeeze the sections of pulp with my hands and MORE water was discovered! So, I decided to squeeze out one of the square molds, too. You can see that half of the empty mold was filled with water from one cube in photo - 6 - ... up in the corner. In the videos I watched on YouTube, they used white paper scraps... I can see why!! 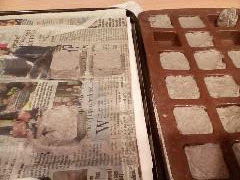 :-) I hope to find some use for recycling newspapers, so I may try to mix the different kinds of paper in the future. For now, I have to squeeze out as much of the water as I can to make the right shapes I need... some to dry and store, some to dry and try as crafting supplies. I also learned a bit about how much water really comes out of this pulping process. A lot more than any video shows! haha... I wonder why! I am now going to collect a lot of sponges and old rags and paper shaping materials for the future. I have wanted to try this for so long, at least now I am learning the way it works and finding a path to the way I want to make it. Maybe some day I will figure out why I can't post photos from the writing screen, like I use to do. That will be a major improvement.